For three days this week the Massachusetts Gaming Commission held hearings to consider the “suitability” of Wynn Resorts to operate its Encore Boston Harbor hotel-casino, which sits outside the major city in the town of Everett. At stake is the license for the $2.6 billion casino. Infamous Wynn Resorts founder Steve Wynn is no longer with the company in any capacity, but regulators are still dealing with the aftermath of a scandal that damaged the casino operator’s reputation. The high-stakes deliberations come as the state considers legalizing online sports betting, which Encore Boston Harbor would be involved with if it keeps its gaming license and the state passes legislation. The final day of hearings was Thursday, and it concluded with the company trying to argue that it has changed. The MGC didn’t give any indication regarding what it might do. Wynn Resorts has cleansed its character, lead attorney says. Chair Judd-Stein: We will take our time in making a decision. She says commission will begin deliberations immediately. Reports speculate that the MGC is more than likely going to fine Wynn Resorts, rather than strip it of its license. Losing its license would likely force Wynn to find a buyer for the nearly-finished casino. The company’s stock price, up about 12% this week, reflected the likelihood of a favorable regulatory result. The Nevada Gaming Control Board fined the company $20 mm in February. Some expect that to be the fine in the Bay State as well. Apparently public sentiment also backs that up. The Boston Business Journal ran a reader poll with their coverage of the Wynn Resorts hearing. Poll results so far: 61% say Wynn should retain their license, but pay a heavy fine; 31% say after all the controversy, Wynn shouldn't keep the license; 8% haven't kept up with details. Encore Boston Harbor is 94% complete ahead of a June 23 opening. Reports indicate that Wynn Resorts CEO Matt Maddox may be vulnerable and that the commission make seek to have him step down. The casino operator last year acquired a 22.5% stake in European online bookmaker BetBull, which came in addition to its existing sports betting relationship in Nevada with Miomni Gaming. Wynn Resorts has not specifically addressed the potential for offering sports betting in the Bay State, thanks to its license being up in the air. That could change in the coming months. The casino, which is expected to employ 5,800 people, will have 210,000 square feet of gaming floor space, featuring 242 table games and 3,158 slot machines. The property will also have the standard casino amenities, in addition to a 27-story hotel with more than 600 rooms. Obviously Encore Boston Harbor would like a brick-and-mortar sportsbook, but it has not officially indicated a desire for one in the Las Vegas-style gambling den. Encore Boston Harbor is by far the largest casino investment in the state, more than double the investment of MGM Springfield, which opened in August 2018. While Wynn has been relatively quiet on the sports betting front, MGM has inked numerous partnerships in the space in an effort to be a dominant player in the emergent market. 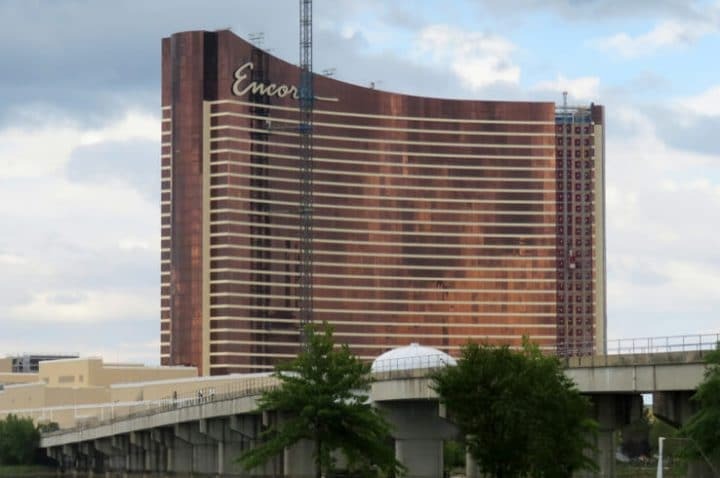 Wynn is significantly behind its rival casino developer, but the location of Encore Boston Harbor (which anticipates eight million visitors each year) will be of tremendous help. Boston is considered one of the country’s top sports towns. It’s also worth noting that Encore Boston Harbor is Wynn Resorts’ only casino outside Las Vegas, so involvement with legal Massachusetts online sports betting is paramount. The problem for Wynn Resorts, however, is that Massachusetts is all in on online sports betting, which renders the location of Encore Boston Harbor less relevant. The governor is also backing a proposal to allow stand-alone sports betting platforms (untethered to a brick-and-mortar gambling facility), which would enable Boston-based DraftKings to offer online gambling on its own. DraftKings offers online sports betting and online casino games in New Jersey under a partnership with an Atlantic City casino. The red tape in Massachusetts could be significantly less cumbersome. There are a dozen bills relating to sports betting on the table in Massachusetts, with widely varying ideas for how the industry should be implemented. No hearings have been planned. It’s unclear if the status of the Encore Boston Harbor license has delayed sports betting momentum in the legislature.